An Australian company believes it has come up with a way to finally make hoverboards safe—or at least safer. But instead of addressing the issue of faulty batteries and shoddy electronics, it’s instead created a bag that it claims will safely contain your hoverboard’s inevitable meltdown. To reiterate. 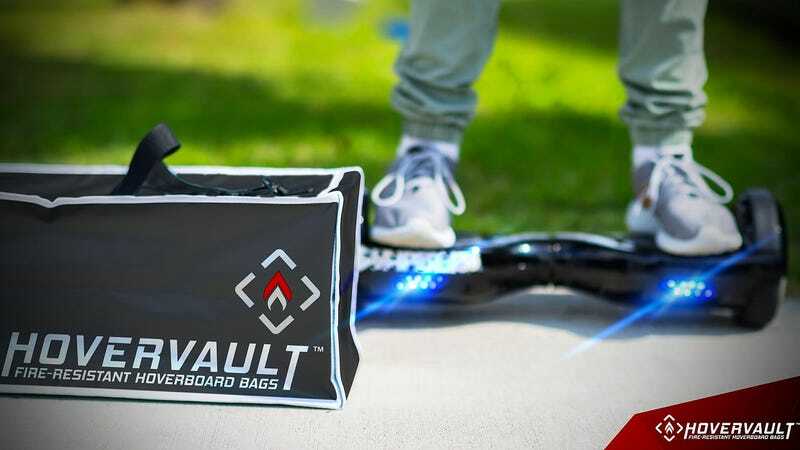 Homescreen Media’s Hovervault, as the bag is called, doesn’t prevent your hoverboard from exploding, catching fire, or turning into a puddle of toxic melted plastic. Apparently we’re at the point where it’s assumed all hoverboards will inevitably reach that point. The fire-resistant Hovervault (not fire-proof) is made of fiberglass composite materials that will contain the flames and heat when your hoverboard eventually explodes into flames—whether that’s while it’s charging, or while it’s being transported. If the meltdown happens while you’re riding and actually “hovering”, the Hovervault can’t help you, so it’s best just to run away once you’ve captured the whole thing on video. It’s also important to note that the Hovervault doesn’t suddenly make it OK to bring your hoverboard onto a plane. The $35 bag is actually designed to let smoke escape in the event of a fire, which is the last thing anyone wants filling a plane’s cabin. The safest solution is to take your hoverboard and throw it into the nearest lake, but barring that, the Hovervault might one day prevent your home from being burned to the ground.